As of version 3.0, MongoDB now supports several different storage engines. One of the engines available is an experimental “In Memory” engine. MongoDB automatically loads frequently-accessed data into memory using the default memory-mapped files storage engine (MMAP V1). If you are working with a relatively small amount of data, this on-disk storage engine will likely have your data loaded in memory anyway as part of your active working set. 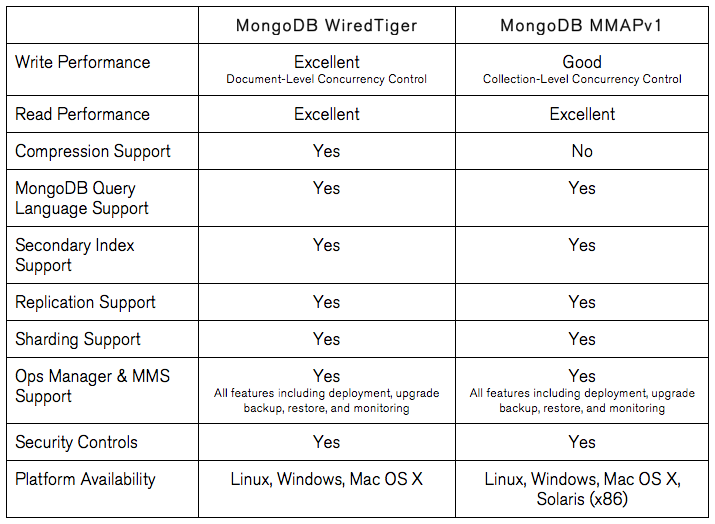 As an aside, here’s a quick comparison of the two on-disk storage engines available in MongoDB 3.0. But developers have still been trying to find ways to force MongoDB into using purely in-memory storage for some time. On the Windows platform, here’s how to play with the new, experimental in-memory storage engine being officially developed by the MongoDB folks. This entry was posted in database, programming language, Verbat and tagged steve lathrop, storage engines, storage options. Bookmark the permalink.